When the market gets hot, people tend to forget about their property taxes. Even the Sacramento County Assessor shows there were 35% less appeals filed last year compared to previous years (see graph below). We all know the market increased rapidly in recent time, but some people frankly still should have appealed, but they didn’t. 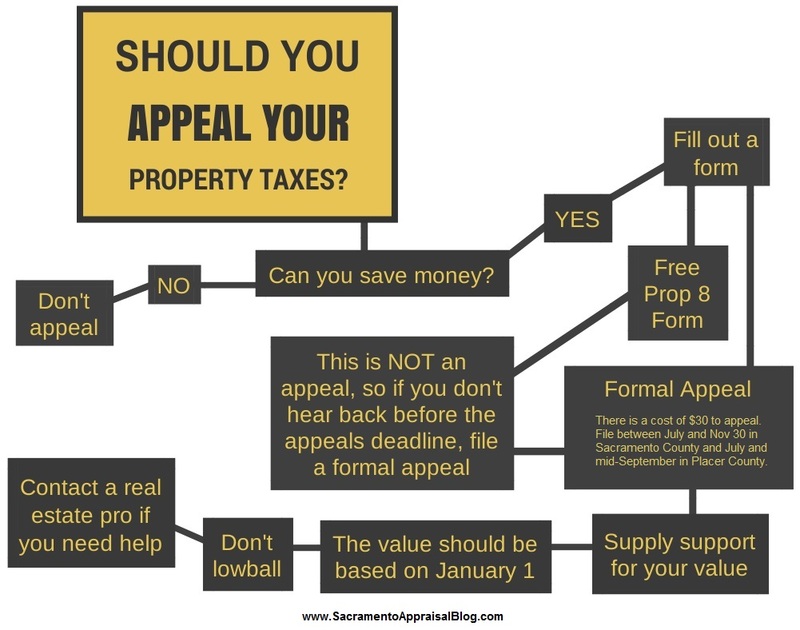 Here is how the appeals process works and some tips to consider for this year. Real Estate Agents & Loan Officers: Knowing these tips makes you well informed and an enormous asset for your clients (download a larger image to use in your newsletter). I hope this helps. The Date: Your assessed value is based on January 1 of the given year – NOT today’s value. 2004-2007: If you purchased from 2004-2007 in particular, be sure to pay attention to your property taxes this year since the market is not quite back to those price levels yet in many cases. Wait Until July: Wait to see how the Assessor assesses your property before deciding to appeal. New assessments should be out in very early July. Do NOT hire anyone (including me) to help you appeal before you know what your assessed value is. Your Wallet: Remember that ever $10,000 in assessment is about $125 out of your pocket. This is a good gauge to keep in mind to help you decide whether it is worth it to appeal or not. Deadlines: You can begin appealing in early July, but the deadline to dispute property taxes in Sacramento County is usually November 30 (sometimes December 2). The deadline to appeal property taxes in Placer County is usually mid-September (dates will be announced by July). Two Form Options: There are 2 forms you can fill out. The Prop 8 “Decline in Value” form is a free informal review and the Application for Changed Assessment is $30 and is an actual appeal. Knowing the difference can make a huge impact for you and your clients because sometimes people think they appealed, but they actually only filled out the free form. Here is a brief video explaining the differences between these two forms. My Recommendation: In this market I recommend filling out the free Prop 8 “Decline in Value” form first, but if you don’t hear back by October in Sacramento County or August in Placer County, file a formal appeal. The Prop 8 form has no weight or power to take your appeal further once the appeals deadline has passed. In other words, if the Assessor disagrees with your value on the free form, you cannot move the conversation forward or have the right to an appeals hearing once the deadline to appeal has passed (since you did not actually file a formal appeal). Lowball: Don’t lowball your value. Comps Near January: Support your value with sales close to January 1 of the given year. Make sure your “comps” really are comparable. Don’t just use the lowest sales in the neighborhood. Use whatever is comparable. What Happens After You Appeal: The Assessment Appeals Board will either agree with your value, propose a new value that you can either accept or reject, or call for an appeals hearing. Try to resolve your appeal before the hearing. Otherwise bring your support to the hearing and argue your case. Resolving your appeal prior to the hearing can happen over the phone with whatever appraiser is assigned to your case. This is where knowing the market and all comps really well comes in very handy. By the way, this graph shows the number of appeals filed last year after the market really heated up. What will happen this year? A Resource for Your Blog & Newsletter: For my real estate friends, let your clients know about the tips above by forwarding this post. Or you can use my property tax flow image on your blog, Facebook or in your newsletter (just link back to me). Here is a larger-sized image too in case it’s relevant. Just click on the thumbnail and save to your desktop. My Services: I’ve done quite a bit of work with “decline in value” property tax situations, but also with escape assessments and other base-year value challenges. I don’t use a full appraisal because it’s really not needed in most cases. Instead I developed a more limited custom valuation product that is amply informative, yet it costs less than a full appraisal. Questions: Any other tips? Why do you think there were less appeals filed last year? Have you ever disputed your property taxes and found success? I got some great news recently for a client, so I wanted to share the bliss. This client hired me to help him get his property taxes in sync with the current market since his home in Carmichael was overassessed by over $200,000 (ouch). After I turned in my tax appeal report to the Assessment Appeals Board in Sacramento County, his assessed value was lowered by $222,574. This means he’ll be getting a $2,300+ refund check in the mail. Cha-ching. There is so much confusion and dishonest information out there about the property tax appeals process. If you have any questions, you may want to read 5 Things to Know about 2013 Property Taxes (or watch the video below). Then be sure to look up your 2013 assessment on the Assessor’s website. Question: What would you do with a $2,300 refund check? Comment below.